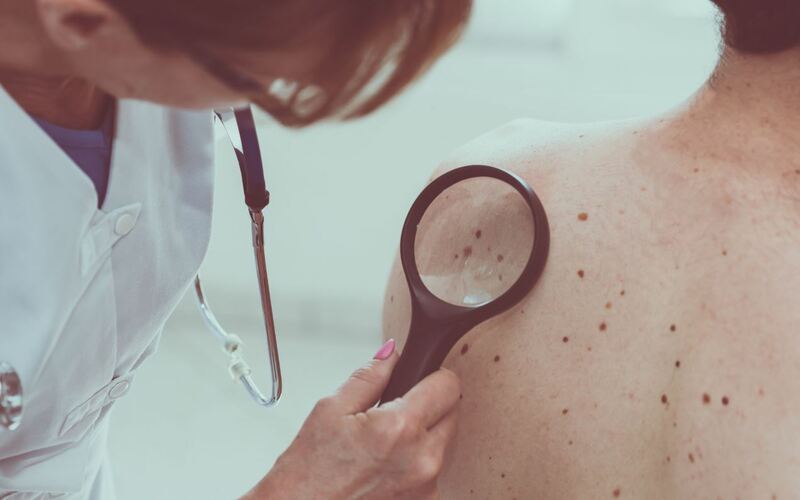 The Skin Cancer Foundation recommends you perform a skin check monthly to help identify any changing lesions that might be cancerous or precancerous. If you do find something atypical, it’s important you see one of our board-certified dermatologists at English Dermatology, who are specialists in skin cancer diagnosis and treatment. They can then conduct a more thorough exam to determine whether or not the abnormality is potentially harmful. First, don’t be alarmed if you find a mole or two (or more). A normal mole is smooth to the touch and has a consistent color, be it brown, black, or tan. It has a consistent border, as well, and is oval or round, and it could have a flat or raised profile. An irregular mole that you should have checked more comprehensively has an irregular shape or jagged border. It’s rough to the touch and is often a combination of colors: various shades of brown throughout the lesion or a mixture of red, white, and/or blue. In addition, be aware of new spots or lesions, or look for older ones that have changed in color, shape, size, or texture. Furthermore, be on the lookout for atypical sores, lumps, or blemishes, especially ones that crust over, bleed, itch, ooze, and itch as well as cause pain or are tender to the touch. Although you can adequately perform a skin check any time, doing so at shower or bath time, is convenient, as you’ll already be naked. It doesn’t matter if it’s before or after, but looking at as much skin as possible is a must. If available, enlist the help of a partner, as a second pair of eyes is always a good idea to make sure nothing is missed, particularly on the scalp or back. Facing the full-length mirror, examine your lips, nose, mouth, forehead, ears, neck, shoulders, chest, arms, underarms, hands, palms, between the fingers, the fronts of the thighs, and the shins. If you’re a woman, lift up your breasts to check the undersides. Continue by bending your elbows to examine your forearms and the backs of your upper arms. Standing with your back to the full-length mirror and using the hand mirror, inspect the back of your neck, shoulders, upper back, and any part of your upper arms that you could not clearly view earlier. Continue in this position by scanning your lower back, buttocks, and the upper part of the back of your legs. Check your scalp by parting your hair – with a brush and/or hairdryer, if necessary – as well as around and behind your ears. While sitting on a stool or chair, prop your feet up and check the backs of your calves as well as the tops and bottoms of your feet, including between the toes. Finally, still sitting, use the hand mirror to examine your genitalia and any parts of the buttocks or upper legs you may have missed. If you find an irregularity or skin change that cannot be explained, contact the skin cancer experts at English Dermatology immediately to schedule a full, comprehensive skin exam. In addition to performing your skin check monthly, it’s important to schedule an annual skin check with our dermatologists. Don’t wait – it could save your life.